Avant is the Audi byword for grace under pressure – it stands for intrinsic elegance combined with optimal adaptability to the demands of everyday life – and the perennially popular format returns to the A6 range this month. The new Audi A6 Avant not only integrates a 1,680-litre maximum luggage capacity into its flowing lines more seamlessly than ever, but also takes on board standard mild hybrid drive, a wealth of new technology including the fully digital MMI touch response operating system and a broad spread of state-of-the-art driver assistance options. With sharp lines, large surfaces and the distinctive low-profile rear window, the look of the new Audi A6 Avant exemplifies the brand’s new design language. A wide, low Singleframe grille dominates the front, while the elongated silhouette and trapezoidal window surfaces dominate the side view. Distinctively shaped blisters, which visually emphasise the quattro drive, extend over the wheel housings. The muscular roofline flows into the low-profile D-pillar, beyond which is a roof edge spoiler that extends the silhouette and complements the athletic stance. At the rear, a decorative trim provides a link between the lights. A total of twelve paint colours will be available, and in the UK it will initially be possible to combine these with two specification levels – Sport and S line. The new Audi A6 Avant is 4.94 metres long, 1.89 metres wide and 1.47 metres high, providing the framework for a cabin that is even larger than before, with front and rear elbow room and rear knee room that are the most ample in the class. Despite the even more rakish lines, the new A6 Avant matches the outgoing car for luggage capacity. It offers a loading width of 1,050 millimetres and a capacity of 565 litres in five-seat mode, increasing to 1,680 litres with the standard 40:20:40 backrests folded down. The tailgate and the luggage compartment cover open electrically as standard, and an optional sensor is available for the tailgate which enables it to be opened using a simple movement of the foot. Using the standard luggage compartment rail system customers can individually position four variable lashing points to secure objects. A tensioning strap, a net and two hooks are also included and an optional load-securing kit with telescopic bar and strap can also be added to allow individual sectioning of the luggage compartment. Short shrift is made of long journeys in the new A6 Avant thanks to the overall comfort afforded by the extremely rigid steel and aluminium body and the top class aerodynamics and aeroacoustics which contribute to exceptionally low interior noise levels. The drag coefficient of the entry-level engine version, which will go on sale after the market launch, is 0.27. With frequent drivers and commuters in mind, the A6 Avant provides an extensive range of driver assistance systems, divided into “City assist” and “Tour” packs. The City assist pack includes features such as the new crossing assist system, while the Tour pack offers adaptive cruise assist, which supplements the adaptive cruise control by means of gentle steering intervention to keep the vehicle in lane. Efficiency assist, also part of the Tour pack, promotes an economical driving style, predictively factoring in speed limits, bends, roundabouts and – if route guidance is active – turnings as part of the cruise control function and also providing haptic feedback via the active throttle pedal. Emergency assist enhances safety by recognising when the driver fails to act and providing a visual, acoustic or haptic warning. If the driver fails to respond, the system takes over, turns on the hazard warning lights and automatically brings the A6 to a stop in its own lane. The system activates Audi pre sense protection measures, such as seat belt tensioning, window closing, and automatically makes an emergency call. Behind the extensive assistance systems lies a high-tech module: the central driver assistance controller (zFAS). It continuously calculates a detailed model of the environment from a fusion of sensor data. Depending on equipment, the sensor set includes up to five radar sensors, five cameras, twelve ultrasonic sensors as well as a laser scanner – another major innovation. Robust response across the range, outstanding comfort and efficiency and optimal economy in real world driving characterise the four and six-cylinder TDI and TFSI engines powering the new Audi A6 Avant. All are supported by Audi mild hybrid technology (MHEV) based around a belt alternator starter which recovers energy during braking that is harvested by a separate lithium-ion battery and also enables engine-off coasting at speeds of between 34mph and 99mph to conserve fuel. An enhanced start-stop function that is active from just over 13mph is also standard. All versions will be equipped with either seven-speed S tronic twin-clutch or eight-speed tiptronic automatic transmissions, and quattro all-wheel-drive will be a standard or optional feature depending on model. The sport differential that actively distributes power between the rear wheels when cornering at speed will also be available. The compromise between driving comfort and handling agility has been even more delicately balanced in the latest A6 Avant, regardless of which of the four suspension set-ups is specified. The choices include a conventional steel spring suspension which is standard, sport suspension, suspension with damper control and adaptive air suspension, also with controlled damping. Progressive steering which becomes even quicker and more direct as the steering angle increases is standard, and dynamic all-wheel steering can also be added to further enhance this agility. It can vary the steering ratio between 9.5:1 and 16.5:1 as a function of speed with the help of strain wave gearing at the front and a spindle on the rear axle that turns the rear wheels by as much as 5 degrees. At low speed, the wheels steer in the opposite direction to the front wheels, reducing the turning circle by up to 1.1 metres to 11.1 metres, while at higher speeds the wheels turn in the same direction to optimise stability when travelling in a straight line or changing lanes. In addition to the dampers and the air springs, the electronic chassis platform (ECP) also controls the dynamic all-wheel steering and the updated sport differential. The driver can adjust the settings for all controlled suspensions in the Audi drive select dynamic handling system. The interior of the new Audi A6 Avant features stylish, minimalist architecture which harmoniously integrates the new operating concept. A black panel surface with the embedded top MMI touch response display dominates the sleek instrument panel. Just like the bottom display on the transmission tunnel console, it is angled slightly towards the driver. The horizontally oriented lines in the interior reinforce the impression of a large space where all elements relate logically to each other. Progressive and elegant colour schemes, beautifully soft leathers, rich open-pore woods and the option of interior fragrancing via an ioniser ensure that the exceptional new onboard technology is embedded without detracting in any way from the hallmarks of luxury and exceptional craftsmanship that are expected from an Audi cabin. The driver of the new A6 Avant has access to the majority of functions via two large displays in the MMI touch response operating concept. Infotainment and navigation are managed from the top display, which measures 8.8-inches in standard form or 10.1 inches where the optional MMI navigation plus upgrade has been specified. The lower 8.6-inch display, located in the console in the centre tunnel, is used for the climate control and for the convenience functions and text input. To create the ultimate high tech environment the fully digital Audi Virtual Cockpit with its 12.3-inch high resolution in-binnacle LCD screen is optionally available, as is a full colour head-up display. Natural language voice control turns the new A6 Avant into an intelligent dialogue partner. It replies to commands and questions in two ways: with data stored onboard or with knowledge from the cloud. The standard personalisation function offers up to seven individual profiles, allowing several drivers to store up to 400 settings from many areas. The optional MMI navigation plus is the top-of-the-line component in the infotainment range for the new Audi A6 Avant. Its data transfer module supports the LTE Advanced standard and incorporates a WiFi hotspot. The navigation system uses Personal route assist to recognise the driver’s preferences based on previous journeys and generates intelligent suggestions from this information. 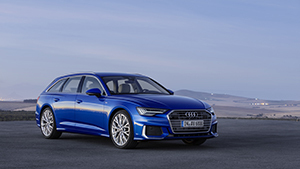 The Audi connect portfolio offers numerous online services, including the optional Audi connect key, which allows the driver to lock and unlock the new A6 Avant via an Android smartphone. The myAudi app connects the car with the owner’s smartphone. Stand-out optional features also include the Audi Phone Box supporting telephony with the highly convenient Voice-over-LTE protocol, and the Bang & Olufsen Advanced Sound System delivering incredible 3D sound clarity through a total of 15 loudspeakers. If you like this website, and would like to give something in return, you can make a donation. Your donation will be used to help pay for hosting service, and on improving the website and facilities for members. If you would like to make a donation, please enter your amount and follow the PayPal link. Could be anything, but my money is on drop links. At 104k miles it could be one of the top arms too. Let us know how you get on. Re: Upper Track Control Arm Bushes Split? Hi everyone. I have a late 2015 (facelift) a6 avant bitdi that I am planning to remap, have few questions. Re: C6 S6 Engine Rattle – Manifold? Hi, please would you let me know if you/how you solved this terminal 30 fault? C6 S6 Engine Rattle – Manifold? Hi all - new to the forum but looking for help. Got the aux cable to work with a Bluetooth device, bought from ebay for the grand sum of £2.50, can now play Spotify through my speakers and receive calls. Actually managed to get this sorted, turns out having the fuse in the right holder will give the module power!